Humans have long revered crocodiles, from the Egyptians who made them gods, to the geniuses who realized the value of a bump and a splash pool in their miles. 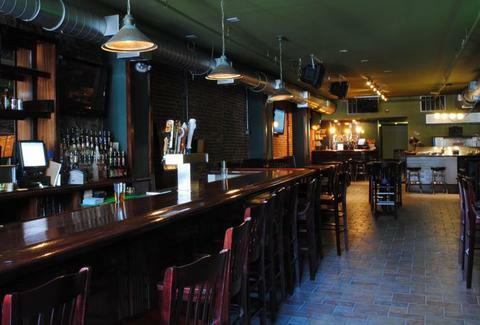 Now the amphibious reptile's bringing food and drink to Old City, at The Crocodile. Already holding it down with joints in Chicago and NYC, Croc's Philly outpost is serving up grub at fire-sale prices in a two-story interior with a stone-tiled floor, exposed brick walls, high-/low-tops against church pew banquettes, tufted leather booths, and a lengthy mahogany bar downstairs, plus an upstairs lounge with comfy bench seating and LED lighting that can project any color imaginable, except burnt sienna, cause some weirdo always eats that. On the edible side, there's mini-pizzas like Margherita, White, and Veggie deals, specialty pies like the penne/ricotta/mozzarella/marinara "Pasta", and the chicken/ham/mozzarella/marinara/ricotta "Blue Ribbon", plus paninis including the roast beef/cheddar/mozzarella/onion "Cheese Steak" and the mozzarella/cheddar/Parmesan "3 of a Kind", which'll beat a meal of two pears every time. On the drinks side, they're tapping Sly Fox and Shock Hop, chilling cans and bottles like Flying Fish's Exit 4, and prepping "croc-tails" (groan...) like the Jewel of Denile (vodka, champagne, strawberry puree), Orange Crush (vodka, amaretto, champagne, OJ, pineapple juice), and a mix of vodka, energy drink, grenadine, and cherry called the Yellow Rocks, which's infinitely tastier than the Yellow Snow. Croc's also got some flatscreens hung downstairs for watching games (and'll be dishing comped shots when the Phils homer), and have future plans to turn the stage (currently hosting a four-top) into a venue for live acts, enticing folks to bump and slide without the prerequisite of 20 feet of poorly moistened tarp.